China's value-added industrial output, an important economic indicator, expanded 6.4 percent year-on-year in the first three quarters of 2018, the National Bureau of Statistics (NBS) said Friday. The growth rate was 0.3 percentage points lower than in the first half. In September, industrial output increased 5.8 percent year on year, down 0.3 percentage points from August. Industrial output measures the activity of certain large enterprises with an annual revenue of at least 20 million yuan (about 2.9 million U.S. dollars). In the first three quarters, manufacturing output expanded 6.7 percent year on year, mining output rose 1.8 percent, while the production and supply of electricity, thermal power, gas, and water posted the fastest growth of 10.3 percent among the three major sectors. New industries posted faster expansion, with the output of high-tech industries, equipment manufacturing and strategic emerging industries rising 11.8 percent, 8.6 percent and 8.8 percent, respectively, according to NBS spokesperson Mao Shengyong. During the first three quarters, the production index for the country's service sector rose 7.8 percent year on year, down 0.2 percentage points from H1. 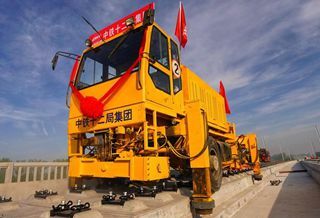 "The industrial and service sectors saw overall stable output and relatively fast growth in profits," Mao said at a press conference. In the first eight months of the year, major industrial firm profits gained 16.2 percent year on year, while profits of major service providers climbed 15.5 percent. The industrial output figures were released by the NBS along with a slew of other major economic indicators, including retail sales and fixed-asset investment. China's gross domestic product expanded 6.7 percent year-on-year in the first three quarters, in line with market expectations and higher than the government's annual growth target of around 6.5 percent.